You can use this exam guide to collect all the information about Java EE 6 Enterprise Architect Certified Master (1Z0-807) certification. 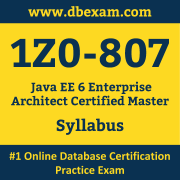 The Oracle 1Z0-807 certification is mainly targeted to those candidates who has some experience or exposure of Java EE and want to flourish their career with Oracle Certified Master Java EE 6 Enterprise Architect (OCM) credential. The Java EE 6 Enterprise Architect Certified Master certification exam validates your understanding of the Java EE technology and sets the stage for your future progression. Your preparation plan for Oracle 1Z0-807 Certification exam should include hands-on practice or on-the-job experience performing the tasks described in following Certification Exam Topics table. Validated Against This exam has been validated against Java EE 6. Application Design Concepts and Principles - Identify the effects of an object-oriented approach to system design including the effect of encapsulation, inheritance, and use of interfaces. - Identify how the Separation of Concerns principle applies to the component model of a Java EE application; including client, the web and business component containers, and the integration and resource layers. - dentify the correct interpretation of Separation of Concerns as it applies to the Java EE service layers, including component APIs, run-time containers, the operating system, and hardware resources. - Identify non-functional and quality-of-service requirements that influence application design, including trade-offs in performance, availability, and serviceability. Common Architectures - Identify the appropriate strategy for deploying client applications to desktop and mobile platforms, the principles for designing a user interface and the benefits of applying client-tier patterns. - Identify best practices for exception handling, logging, and business tier patterns. - Identify design patterns that address specific challenges in the web tier, including authentication, authorization, and scaling and clustering to meet demand. - Identify Java EE technologies, including JMS, JCA and Web Services, and design patterns that address specific challenges in enterprise integration. - Identify the challenges in integrating enterprise resources, the Java EE technologies that address them (including JPA and JDBC), and the communication protocols that support tier-to-tier communication (including RMI, IIOP, and CORBA). Integration and Messaging - Identify the APIs available for a Java EE technology-based system to communicating with external resources, including JPA, JDBC, RMI, Web Services, JMS, and JCA. Outline the benefits and drawbacks of each approach. - Describe the technologies used to integrate business components with Web Services, including XML over HTTP, JSON, SOAP and REST. - Identify and detail the technologies used to integrate business components with external resources, including JMS and JCA. - Identify how a Service Oriented Architecture (SOA) facilitates system integration and best practices. Business Tier Technologies - Identify the correct EJB technology to apply for a given scenario, including entity classes, session beans, message-driven beans, timers, interceptors, and POJOs. - Identify benefits and drawbacks of different persistence technologies such as BMP, CMP, and JPA, including ease of development, performance, scalability, extensibility, and security. - Identify the benefits and drawbacks of implementing Web Services in the EJB component container. - Select the appropriate use of JPA and JPQL in a given scenario. Web Tier Technologies - Identify the benefits and drawbacks of using URL rewriting and cookies to manage HTTP session state. - Identify appropriate uses for JSP and Servlet technology, and JavaServer Faces in a given Java EE application. - Identify the benefits of using an EJB container with a web container instead of a web container alone. - Identify the differences between client pull and server push architectures. - Identify the benefits and drawbacks of using a browser to access asynchronous, lightweight processes on the server. Design Patterns - Demonstrate knowledge of Java EE design patterns including: Service Starter, Singleton, Bean Locator, Resource Binder, Dependency Injection, Payload Extractor, Context Holder, and Thread Tracker. - Select an appropriate pattern for a given application challenge from the following: Facade, Strategy, Observer, Composite, and Abstract Factory. - Identify a design pattern, using a description of its features, from the following: Facade, Strategy, Observer, Composite, and Abstract Factory. - Identify the use of the law of leaky abstractions or a specific anti-pattern in a given scenario. Security - Identify elements of the security model in the Java SE environment for remote clients, including Web Start, applets and the role of the SecurityManager class. - Select appropriate locations to implement Java EE security technologies or features in a UML component and deployment diagram. - Classify security threats to an enterprise application select measures an architect can propose to mitigate them. - Identify techniques associated with declarative and programmatic security, including the use of annotations, deployment descriptors, and JAAS technology. The Oracle 1Z0-807 Certification Program certifies candidates on skills and knowledge related to Java EE products and technologies. The Oracle Certified Master Java EE 6 Enterprise Architect is granted based on a combination of passing exams, training and performance-based assignments, depending on the level of certification. Oracle 1Z0-807 certification is tangible benchmark of experience and expertise that help you stand out in a crowd among employers. To ensure success, Oracle recommends combining education courses, practice exam and hands-on experience to prepare for your Java EE 6 Enterprise Architect Certified Master certification exam as questions will test your ability to apply the knowledge you have gained in hands-on practice or professional experience.